Am I confused, or does New Zealand have so much lamb they can export it all over the world? And if that is the case, in the UK where do all their lambs go if you can only find New Zealand lamb in the supermarkets? When we were in Scotland we saw a LOT of lambs. It was spring and the lambs were bountiful. But in the shops all we could find was New Zealand lamb. If we wanted Scottish lamb we had to go to the butcher. Now, given the choice I would rather buy local. It is grown, slaughtered and butchered without encountering freezers and accumulating travel miles. Having eaten both choices I can tell you that the local bred lamb was far better. The New Zealand lamb is expensive but still nearly 50 percent cheaper than local lamb. Something is wrong here. Our Karoo lamb is some of the finest I’ve ever come across. It is not cheap but still works out at less per kg than what the New Zealand lamb cost us in Scotland. I’ll never complain about the price again though as I can buy South African lamb at any supermarket here. Do you buy locally farmed meat? PS Next week’s Food on Friday is all about soup! A very tasty lamb dish, Tandy! I buy organic locally produced meat. Always! Or locally meat without hormons, etc! 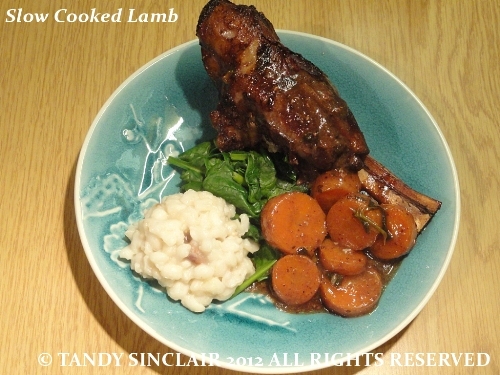 Love this slow cooked lamb recipe, just looks like its falling off the bone tender. I’ve wanted to get a tagine, those I’ve seen look small and I wonder how all the food would fit! Unless its just for two! I bet it just fell off the bone! Most of the lamb in the US is from NZ also! Low and slow is the best way to cook it methinks. Hi Tandy, love reading your blog. The lamb entry was very interesting as I love in South Wales in the UK and our lamb is very well thought of and available at most of the local supermarkets. In fact most of the lamb that is fresh and not frozen over here in the UK is British produce, in the last few years New Zealand have started sending over chilled lamb and not the frozen lamb that used to be available very widely (I think a hangover from the last world war), I bought it when I was first married a long time ago but always found it to be rather dry and very tough. The chilled New Zealand lamb I would say is cheaper that what we produce locally – how so when it travels to far, and is very good quality, but I personally would availways buy British Lamb. We also export a lot of our lamb to France, although this has proved rather controversal as the French like to slaughter the lamb they sell themselves so it meant transporting live lambs from the UK to France is this really did cause quite an issue several years ago. Have not heard much on that score for some time now. Sorry this has turned into such a long post but did find your entry and the comments you received on it so interesting and felt that somebody in the UK should write and explain how it seems here. We obviously do not cook lamb enough because my family is predominantly vege but if we do, you provide perfect recipes! LOVE lamb and slow cooked is always fabulous. NZ lamb does seem to have taken over the world, and it’s a shame that the best value is frozen. French lamb is very expensive in comparison and I personally don’t think that it’s that much better and certainly not worth the extra money in these hard times. Tandy, this is a lovely recipe and it definitely goes on my winter list. Is it not strange that when I was in Morocco I did not bother with the season and had a lamb tagine with outside temps of 40° C and more, but at home I do? I love the combination of yogurt, lemon and sumac. I will have to look up arrow root though. Is it still cold in SA? Spring is close, no?